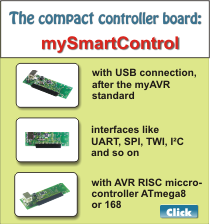 The myXMC hardware is extended with this add-ons, if the hardware has a myMCU standard connector (female connector 20 pole). The connector between hardware and add-on will be realized by multi-pin connector. Some add-ons you can also buy as assembly kit. The myEthernet with the ATmega1284P! 5 myAVR prototyping boards in industrial quality. 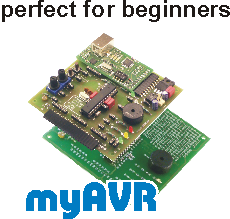 myAVR prototyping board in industrial quality. Dimensions 90 x 60 mm. 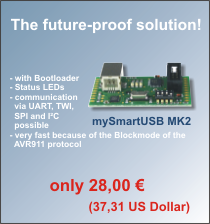 Contains 2 myAVR prototyping boards A, B and C in industrial quality. Ideal for own circuits and projects. All prices included with VAT of 19% or 7%.